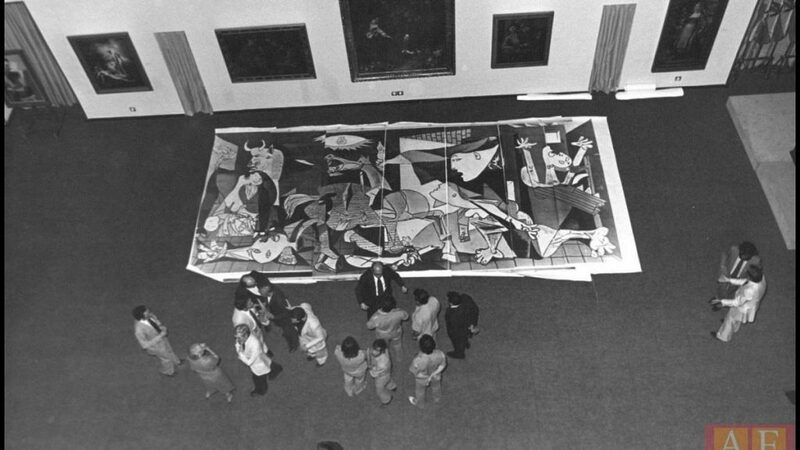 Guernica is a big painting, 3.5m x 7.75m, which spent much of its early life on world tour, and which was parked at MoMA at Picasso’s request, from 1943 until a democratic Spanish government was able to bring it back in 1981. Including a couple of construction-related rehangs, MoMA packed and moved Guernica twenty times during its stay. 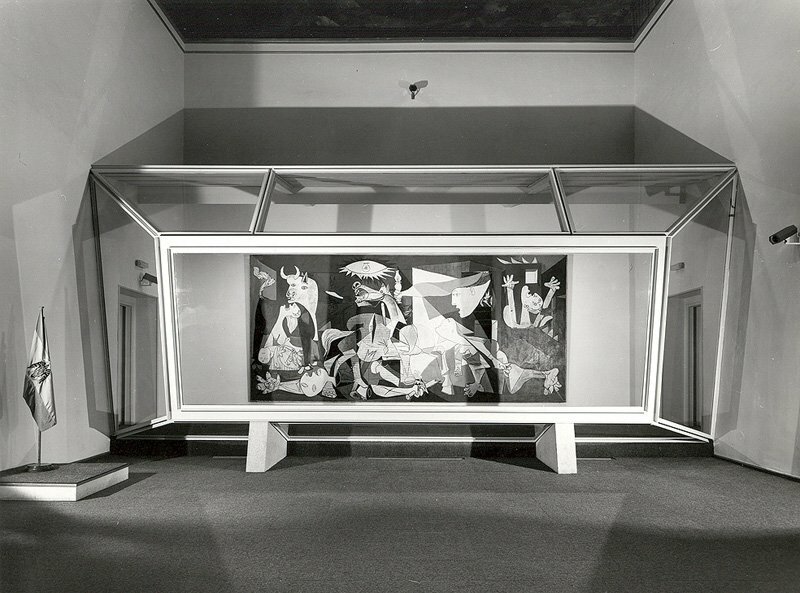 Still, for touring exhibitions organized by the Modern in the 1940s and 50s, they sent a scaled down, but still large, photograph of Guernica instead. Exhibition requests blossomed for Nelson Rockefeller’s authorized, full-scale tapestry replica of Guernica, which he commissioned in 1955. Like the photos, the tapestry became a stand-in for the original, expanding and amplifying its reach. Two other tapestry versions were eventually produced, which ended up in museums in France and Japan. Rockefeller loaned his to the United Nations, where it’s gone on to have its own loaded history. 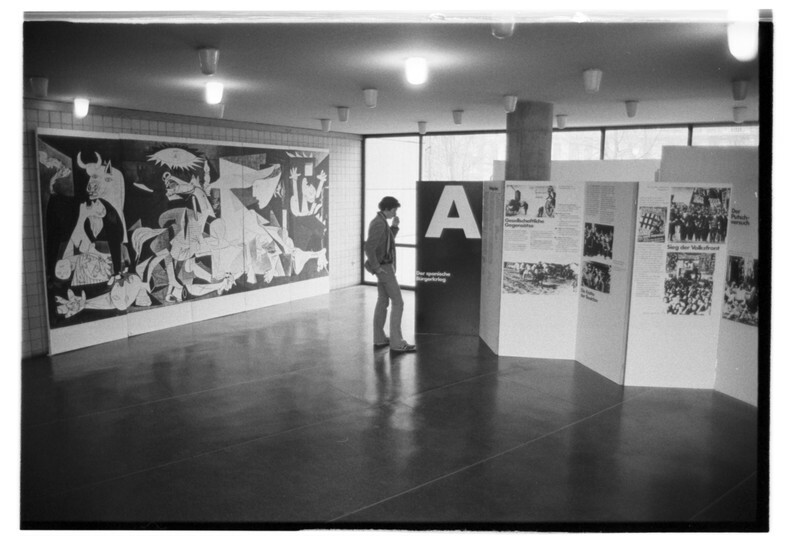 A nearly full-scale photo replica of Guernica was the center of a left exhibition in Berlin in 1975 organized by the neue Gesellschaft für bildende Kunst. The last, best photo replica of Guernica is probably Spain’s own. 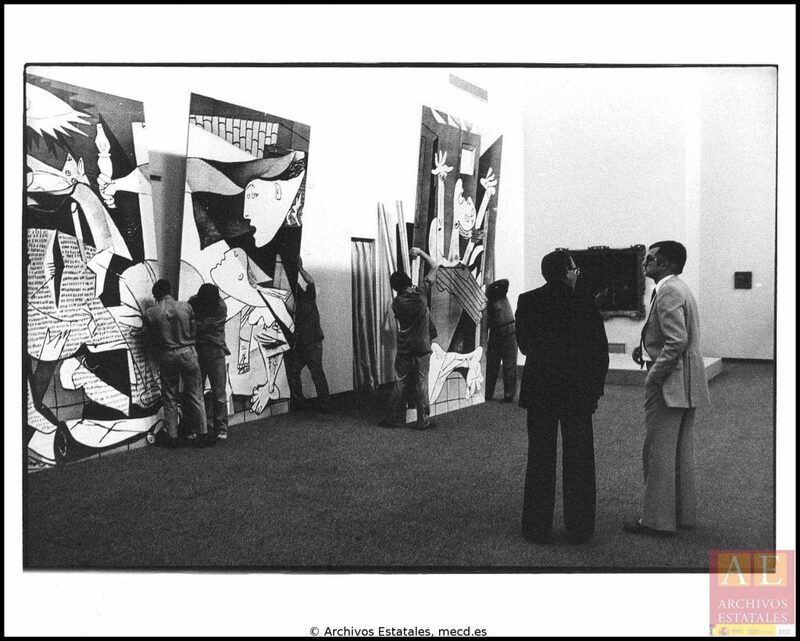 The Reina Sofia created a full-scale, multi-panel photo of Guernica in order to test the exhibition design and installation of the painting in the Casón del Buen Retiro in 1981 [top, above, below]. I have not seen any mention of any of these photo replicas still existing. A full-scale prop version of Guernica appeared in a scene in Alfonso Cuaron’s 2006 film Children of Men, and points to the very recent development of printing technology that allows a 3.5m tall image to be reproduced on one panel. Which, I think I must now do if I can’t find these earlier photo versions. And even if I can.